The VEGA vocational diplomaÊ- Vehicles: electronics and management of automatic systems – is a French 3-year course which trains technicians the field of on-board electronics, including diagnostics and multiplexing. As part of the course, the students have to become familiar with the various hardware and software resources used in the field, including Exxotest products. One example is the study and characterisation of the battery charge status unit (BECB) conducted using Muxtrace software and the USB MuxDiag II interface. 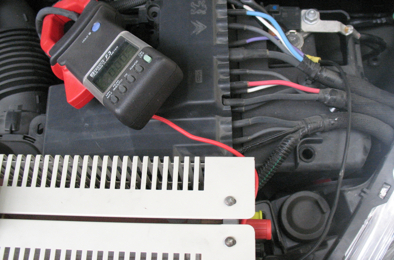 This unit, fitted to the latest generation of vehicles, is connected directly to the battery and provides information about the electrical power consumption of the battery, such as its voltage and the current drawn, as well as the charge status of the battery and its temperature. This information is sent directly to the built-in systems interface (BSI) via a LIN network. The principle of the procedure is as follows: a rheostat is connected in parallel to the battery of a vehicle (a Peugeot 508 SW) which constitutes a load and thus draws various current values, as measured using a current clamp. The Exxotest unit is then connected to the corresponding LIN network and the associated frames are recorded using the Muxtrace software. The students must then isolate the identifiers which indicate the information relating to the BECB and then decode this information; particularly that relating to the current consumed. Another example is the study of the unfastened seatbelt warning on the vehicle’s second LIN network. The first stage is an analysis whose purpose is to identify, using Muxtrace, the bits affected by the fastening of the front and rear seatbelts, depending on whether or not passengers are present. The next stage involves the students activating the various unfastened seatbelt alarms directly via Muxtrace. The MuxDiag II unit combined with Muxtrace software provide a complete solution for the analysis and transmission of CAN and LIN frames. The intuitive approach and ease-of-use is appreciated by students.